Next to Washington, DC, Maryland benefits from the U.S. government’s enormous investment in medical, cyber, IT, defense and other technologies, and all their spinoffs, just like Israel. In health-tech, Maryland is home to ALL the relevant government R&D and public policy agencies with their tens of billions of dollars in research, grants, purchases and partnerships, including the U.S. Food and Drug Administration (FDA), the National Institutes of Health (NIH), the Center for Medicaid and Medicare Services (CMS), and the military medical research centers at Walter Reed Hospital and Fort Detrick. The private sector has taken notice with major pharmaceutical companies MedImmune/AstraZeneca and the GSK Vaccine Division building major centers of excellence in the state. Moreover, Maryland’s world-class academic centers, Johns Hopkins University and the University of Maryland, are producing an immensely educated workforce. Maryland has one of the most educated populations in the country! So, the market’s here, the workforce is here, and the research is here. In other words, the future is in Maryland! It’s the same in IT, big data, cyber, defense and homeland security with the U.S. Cyber Command, the National Security Agency (NSA), NASA’s Goddard Space Flight Center and some of the largest databases in the world at the U.S. Social Security Administration, the U.S. Census Bureau and the U.S. National Security Agency in Maryland. Maryland knows how to handle data and the technology to develop, analyze and secure it. 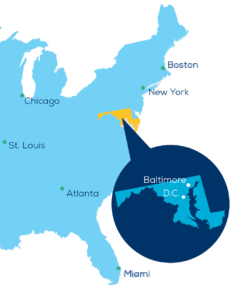 Not only that, Amazon short-listed Maryland as the location for its new 50,000 employee headquarters location, known as HQ2. On top of all this, just a short drive away are the White House, the Capitol, the Pentagon and the rest of the American government, the largest customer of high tech goods and services in the world.